When good food and service come together, it's a beautiful thing. So has been my experience at Lupa Osteria Romana, the casual Greenwich Village trattoria that is part of the Mario Batali food empire. In some ways, it remind me of Fiola, the casual Italian trattoria in D.C.'s Penn Quarter. I've eaten at Lupa twice, and both times I never made it to the "secondi" section of the menu, since the pastas are just too good to pass up. 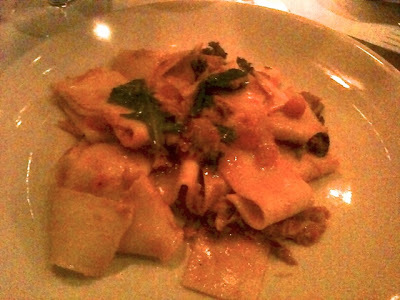 Most recently, we enjoyed tender ricotta gnocchi with a surprisingly light sausage and fennel sauce, and a summer special: pappardelle with chicken-tomato sauce (pictured above). Both dishes were excellent, particularly the perfectly al dente pappardelle with just a hint of chili pepper to give the sauce some zing. As a starter, prep your palate for pasta with Misticanza alla Romana, a refreshing salad blend of arugula, endive, radish and fennel with a light vinaigrette dressing. The panzanella with heirloom tomatoes, red onion, basil and a vinaigrette is a real star, flecked with a bit of anchovy to give it tang (a trick Fiola employed as well), and bread that is toasted through but just soggy enough to not be hard. For dessert, the Lupa Tartufo is a star treat with hazelnut ice cream and chocolate. But I thought the simple gelato of the day, a caramel, was pretty bold as well, having burnt the sugar as much as one dares and still call it caramel. Both times we went, we had expert service, from both our server and the sommelier, the latter of whom I credit for sparking my interest in Nero d'Avola wines. On a more recent visit, our server steered us toward a crisp and slightly fruity white wine to drink with our starters and a full-bodied Barbera with the pasta. Never a bad choice. New York is not a cheap place to visit, and one of the things I appreciate most about Lupa is that it's a good value. Our most recent meal there, which included starters, dessert and wines with both courses came to just over $100 for two people, a real deal for a dinner of this caliber and about half the cost of our dinner at Fiola (and it was just as good). Lupa Osteria Romana, 170 Thompson Street (between Bleecker and Houston), New York City (Greenwich Village). (212) 982-5089. Reservations: Open Table. I really like this place. Thanks for discovering it. I predict we'll be back for a third time.